Hello, Thanksgiving! I created this recipe with the holidays in mind. 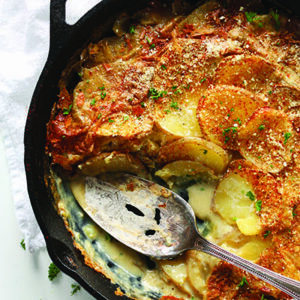 It will easily stand up to your Aunt Betty’s scalloped potatoes that are loaded with butter, cheese, and cornflakes. The difference is this dish is dairy-free, yet remains insanely delicious. No need to save this one for the holidays—enjoy it year-round. Read our review to learn more about Minimalist Baker’s Everyday Cooking and check out more recipes from the book. No need to save this one for the holidays—enjoy it year-round. Preheat oven to 350 degrees F. Heat large 12-inch cast iron skillet (or metal skillet with tall edges) over medium heat. Add flour (or flour substitute, see recipe note) 1 Tbsp (8 g) at a time, whisking to incorporate between additions. Cook for 1 minute. Add almond milk a little at a time, whisking to incorporate. Be sure not to flood pan. Whisk and go slowly to prevent clumps from forming. Continue until all almond milk has been added, then add vegetable broth. Whisk to combine. Reduce heat to low, and let simmer for 4-5 minutes to thicken, whisking frequently. Turn heat off and remove skillet from burner. Carefully transfer sauce to blender and add nutmeg, a pinch more salt, pepper, and nutritional yeast. Rinse out skillet (or grab an 8×8-inch baking dish) and generously grease with oil or vegan butter all the way up the sides. Lay down half the sliced potatoes and season with salt and pepper. Toss to coat, then lay flat and sprinkle on 2 Tbsp (10 g) vegan Parmesan cheese. Add remaining potatoes (only as many as will fit comfortably in the pan) and season with a bit more salt and pepper and loosely toss. Add remaining 2 Tbsp (10 g) vegan Parmesan cheese and pour over sauce. The sauce should just cover the potatoes, so remove any potatoes that are above the surface. Sprinkle top with paprika (optional). Cover with foil and bake on middle rack of oven for 20 minutes, then remove foil and bake for another 40-45 minutes (a total of 1 hour to 1 hour 5 minutes). Potatoes are done when knife inserted into the potatoes comes out without effort, and the top is golden brown and bubbly. Remove from oven and let cool for 10 minutes before serving. As an optional garnish, top with fresh parsley and a dash more paprika for extra color. You can keep this recipe gluten-free by substituting cornstarch or arrowroot starch in place of all-purpose flour.